Welcome to our breakdown of the Best Nerf Automatic Blasters! An automatic Nerf blaster is one that reloads automatically (duh!) but requires separate trigger pulls for each shot. On the other hand, whereas a Nerf machine gun can rapid fire with the trigger depressed. Thus, all Nerf machine guns are automatic, but not all Nerf automatic blasters are machine guns. 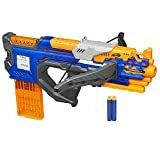 Should I buy a Blaster That Uses Batteries? Our list has blasters that require batteries to operate as well as those that don’t. There are good reasons to use either type; it just depends on what kind of job you need your blaster to do for you. If a blaster operates using batteries, you can be pretty sure that it is going to have a much better rate of fire than its purely mechanical counterparts. In addition, most motorized blasters on the market today––especially those that fire Nerf Elite darts––boast better range and ammo capacity, although, depending on the feeding mechanism that brings the ammo from the clip to the barrel, accuracy can suffer. On the other hand, traditional, mechanical blasters are much lighter for their lack of batteries, and their accuracy is often much higher than that of motorized blasters. Non-motorized blasters shine in the capacity of sidearms or secondary weapons because you never have to worry about running out of juice, which always manages to happen at the worst possible time when using a motorized Nerf gun. Remember: one style of Nerf blaster is not necessarily better than the other. You should pick the blaster based on what you need it for, not on how it operates! 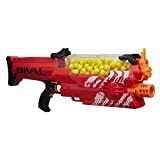 What is the Best Ammo for my Nerf Gun? All of the blasters on this list use one of two types of ammo: Nerf Rival Ammo or Nerf N-Strike Elite Ammo. Nerf Elite ammo is the most popular style of ammo out right now, and for good reason. The majority of blasters being manufactured currently––from the Elite line to the Zombie Strike and Star Wars Episode VII blasters––all use Elite darts. This makes it incredibly easy to swap darts, clips, and magazines between all the pieces in your arsenal. Nerf Elite ammo also has the best range and accuracy for Nerf guns––or had, until the advent of the Nerf Rival ammo style. Nerf Rival ammo is very different from the more traditional design of the Elite darts. The Rival style looks like nothing so much as a bright yellow foam golf ball. But don’t let its looks fool you! Rival missiles can travel at an unbelievable 90 FPS, a velocity that will leave your rivals on the field little time to get out of the way! That fast travel time also ensures that your shots are less likely to go off target. 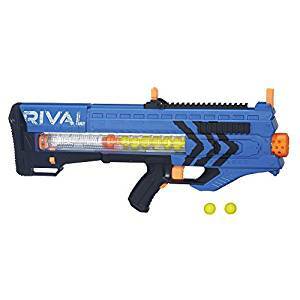 Unfortunately most of the Rival blasters are much bulkier and heavier than Elite blasters because they’re motorized and the ammo needs more storage space, so they can be harder to carry around a Nerf battlefield for extended periods of time. 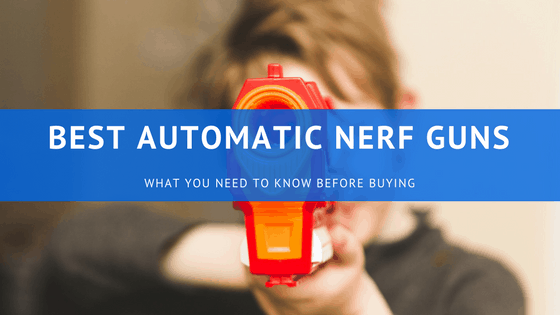 With that out of the way, let’s get down to what you should be looking for in an Automatic Nerf Blaster! The Nerf Elite RapidStrike is one of the best Nerf blasters on the market today. It boasts an impressive rate of fire, enviable range, and the widespread utility inherent in the Nerf Elite ammo style. One of the most amazing aspects of the RapidStrike is it’s versatility. You can fire it in multiple different ways, allowing you to tailor your blasting to the situation at hand, and it's able to utilize magazines and clips from across the Nerf Elite collection. Amazingly useful transparent clip design makes sure you’re always aware of how many rounds you have left. Some have mentioned occasional jamming issues with this blaster. The CrossBolt scratches an itch we’ve had for a long time. After all, Nerf has disappointed us time and time again with blasters that only pretend to be crossbows. That’s not to say that all blasters like the BowStrike are inherently bad; it’s just that we’ve been waiting for a blaster that actually functions like a crossbow, and thanks to the Crossbolt, we finally get to see what that would look like. Even better, the CrossBolt is an amazing blaster, and not just because it truly functions as a CrossBow. 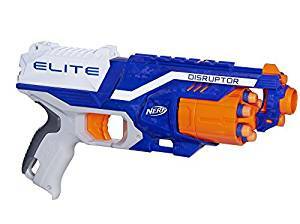 This blaster utilizes a string-firing mechanism that can fire Elite darts up to 90 feet, which is in line with all of the top-notch Nerf Elite blasters. It’s clip fed so it can fire just as quickly as you can prime it (up to 12 shots per magazine––and that’s only with the stock magazine). All in all, the CrossBolt was a long time in coming, but it was well worth the wait. You might look at this blaster and think that it’s just a slightly updated version of the (now defunct) Nerf Strongarm, and you’d be right. But there’s a saying, “If it ain’t broke…” and with the Strongarm no longer available in stores, the Disruptor is a very attractive purchase. So what makes the Disruptor so awesome? The slam fire feature means that you can hold the trigger while you quickly work the priming mechanism on top of the blaster to rapid fire darts. Or you can just prime a single shot and keep the Disruptor ready for action at a moment’s notice. Slam fire in conjunction with this blaster’s amazing range means that you can control the action at any range and at any tempo. The huge 90-foot firing range gives you control of a wide swath of the battlefield. It doesn’t look quite as awesome as its predecessor. The Zeus, much like its namesake, is truly a godly force on the battlefield. Its rate of fire is awe inspiring, and reloading right on the battlefield is too easy. Not only that, but Nerf really hit it out of the park when they designed the Rival ammo, as it boasts superior range and accuracy. The Zeus is one of three flywheel motor blasters on this list and its performance makes it easy to see why many Nerf players are moving away from the spring-powered variants in favor of motorized blasters’ dominant range, missile velocity, and shot consistency. Fires Nerf Rival ammo at an astounding 100 FPS––that’s 30 meters per second of sheer rival-annihilating velocity! Last but not least on our list is the Nemesis, another entry in the Nerf Rival series. While it shares the same imprint as the Zeus, that’s about where the similarities end. The Nemesis may be an expensive blaster (around $100) but trust us when we say that it’s worth every penny. Whether you’re looking at rate of fire, range, ammo capacity, or versatility, the Nemesis outperforms virtually every other blaster on the market today. It wouldn’t be a stretch to say that it’s the best one on this list, even though it does have a few downsides. 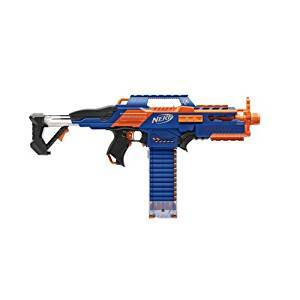 Hands down, the Nerf Rival Nemesis is our top pick for Automatic Nerf Blaster. It fires fast, it fires accurately, and it fires forever (or near enough). The Nemesis is easy to reload and easy to use, provided you can carry this sucker around! But for those not worried about the weight issue, we really can’t think of a better pound-for-pound (ha!) blaster. Second place easily goes to the CrossBolt. It has quite impressive performance, gets major props for using Nerf Elite ammo (and being able to use a variety of clips and mags), and scores extra points just for being A FRICKIN’ CROSSBOW. Add a strap to the CrossBolt and you’ve got a secondary weapon that will never let you down. That’s it for our Top 5 Automatic Nerf Blaster Breakdown!